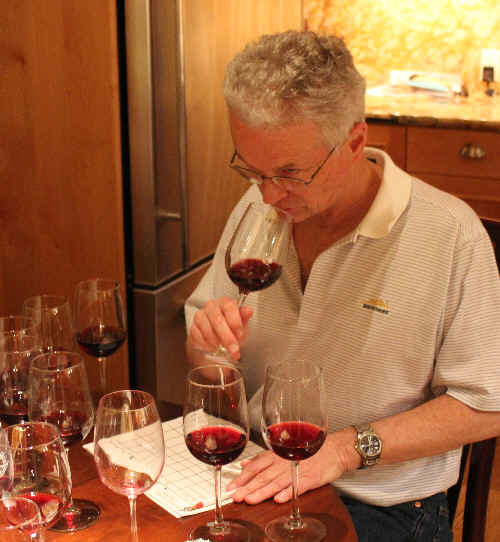 We assembled a set of California Pinot Noirs from a handful of storied wineries and tossed in a few random selections to this month's tasting. 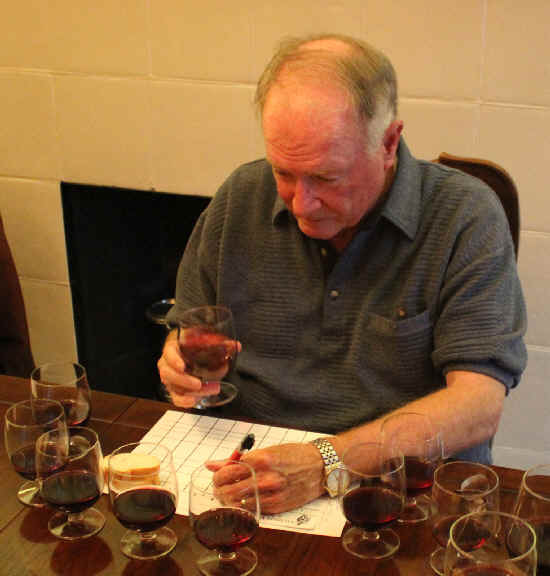 The Pahlmeyer winery makes a pricey bottle of Pinot Noir and they select what they feel to be their best barrels for their first label. The rest is bottled under the Jayson label. 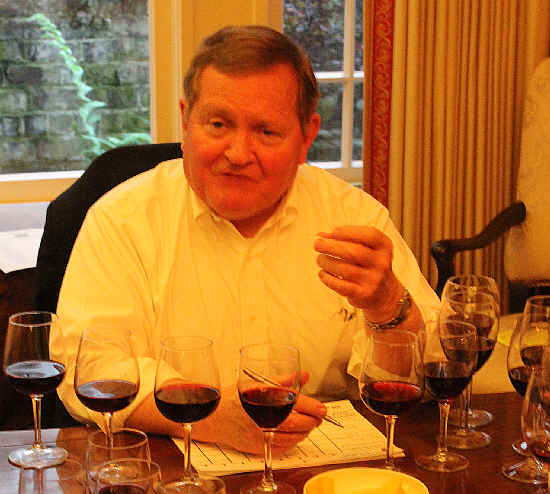 Would the Pahlmeyer wine finish ahead of their Jayson bottling? How's Sanford doing under the Terlato crew? 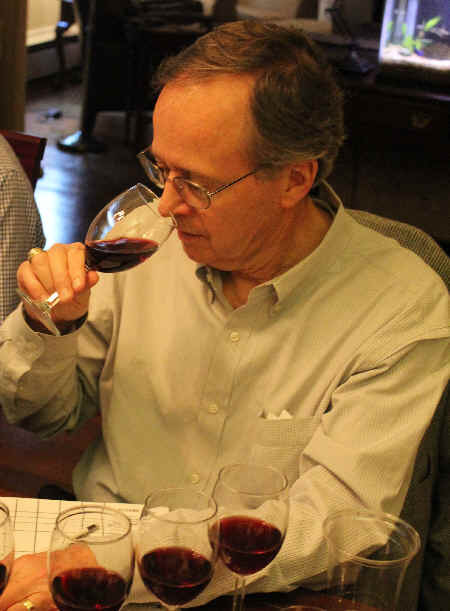 How's Napa's Phelps family doing making Sonoma Pinot Noir? 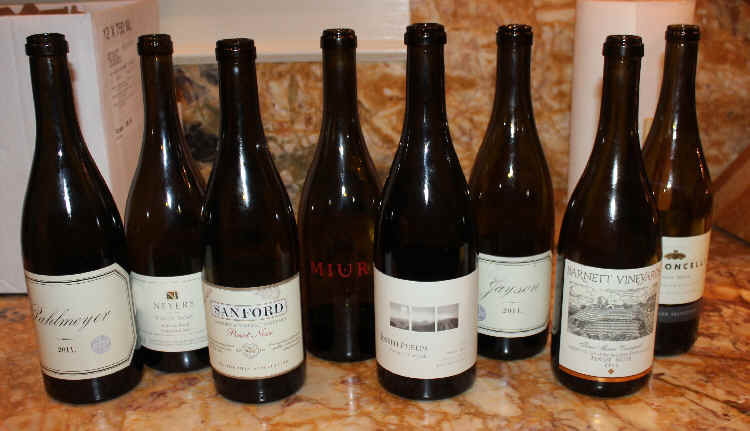 Miura specializes in Pinot...how's their Pisoni bottling? 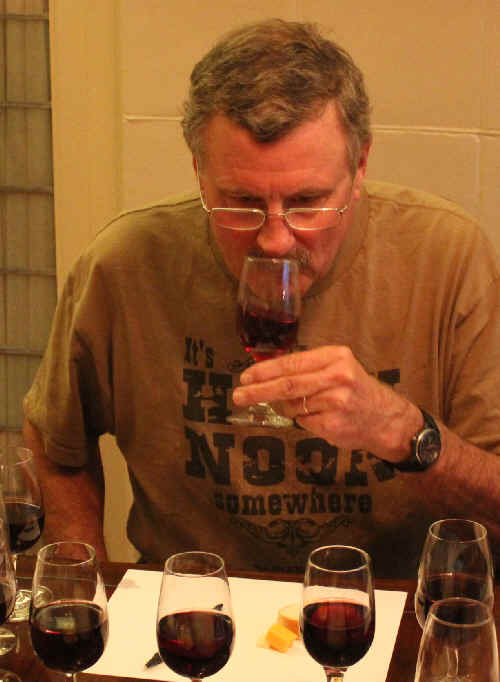 Phelps' former sales manager has his own winery, Neyers. Pedroncelli, known for its well-priced wines...how's does their $18 Pinot compare to these various bottlings at two, three and four times the price? Two wines out-paced the group. The value-priced bottle finished dead last, well behind the group. Six of the eight wines had a first place vote and six had a last place ranking. Overall, though, the quality of the wines was fairly high and even the last place wine was good, if lacking a bit of intensity. Clear in appearance and with a medium garnet color, this wine actually shows nice Pinot Noir fruit...it's got a red fruit quality and just a touch of wood on the nose. It's dry and moderately acidic, being medium+ bodied on the palate. I detected a bit of heat on the palate and the wine is mildly tannic, giving it a bit of coarseness. Perhaps these elements made it seem a bit shy of Pinot fruit? It simply lacks a bit of depth and some charm at this early stage. I'll bet, though, that this ages nicely and will reward 5 to 10 years of cellaring. At this stage, though, it merits perhaps a one-half star rating. Medium garnet in color and clear in appearance...the aroma of this wine suggested fairly ripe fruit as it came close to being jammy. I found the nose to be intriguing, though...ripe berries, dark fruits. It's dry and moderately acidic. Medium bodied. The flavors shows red fruit with a touch of candied orange. Good! Drinkable now. I gave it a one star rating on my three star scale, no stars being an average or standard quality wine. Clear in appearance and garnet in color, the nose was quite attractive here from the start. Mildly herbal, with a bit of sweet oak and a touch of a floral, rose petal tone. Quite good. It's dry on the palate and moderately acidic. Medium+ body. Fairly full flavored Pinot Noir...lots of red fruit notes. Nice balance. One star. Clear in appearance, with medium deep ruby color...fairly dark for a Pinot Noir. The nose of this wine was a delight! Hugely aromatic and intensely "Pinot" with a mildly minty quality. Very promising. It's dry and nicely acidic, with medium to medium+ body. I enjoyed the vanillin layer of oak here with lots of red fruit flavors. Nicely done! This was good Pinot Noir. One-and-a-half to two stars+. Clear in appearance and medium ruby in color, the Miura wines displayed a mildly spicy quality with some pleasantly woodsy notes. It's dry and moderately acidic. Medium-light in body. The red fruit character is on display from the start...very bright, fresh, flavorful. Good Pinot Noir! One star. Showing a medium ruby color, this wine was clear in appearance and showing lots of red fruit on the nose. There's a light oak quality here, but also some woodsy, toasty tones. It's dry and moderately acidic. Medium-light on the palate...though it's a year or two older than the other wines in this tasting, it's still a bit tight or lean. Nice red fruit flavors on the palate, but it could use a slight bit more intensity. Nice, though. One star at this point...maybe time will enhance this? Medium ruby in color and clear in appearance, this wine had a remarkably attractive fragrance! Lots of bright fruit aromas and beautifully sweet, woodsy fragrances...I was totally enchanted by the nose as it was intense and expressive. The wine is dry on the palate and moderately acidic...medium-bodied...beautifully ripe fruit on the palate...thoroughly delicious and drinkable now. Not sure this will age well, but it's irresistible now! Two stars+! Clear in appearance and medium cherry red in color, this wine displays a nicely high-toned red fruit quality. It's got a good balance of red fruit and sweet oak. Medium-bodied, this wine has tremendous fruit on the palate, beautifully berryish and nicely oak. I had it just a half an notch between my first and second place wines. One-and-a-half stars...and you'll notice I had this ranked just a notch ahead of their "Jayson" (second label) bottling.